Affogato means drowned. Not monkey-cat. I had an affogato at Four Barrel Coffee (fourbarrelcoffee.com) this afternoon that should be a controlled substance. It was the most potent affogato (shot of espresso over a scoop of gelato) I have ever had. I was willing to expose myself to dairy products to try it, and remain stunned. Caffeinated, pleased, and stunned. P.S. I wasn't accusing you of thinking that affogato means monkey-cat. Just because it sounds like Affen (German for monkey) and Gato (Spanish for cat) doesn't mean your brain would file it under 'monkey cat espresso dessert' like my brain did. If your brain also did this, call me: we should talk. I don't really mind having someone not remember my name, if I get the experience of being at a major coffee house and having my soy latte prepared and know it is mine because the barista (who did not take my order) says, "Bizarro! Bizarro!" Which is an experience I have now had, and enjoyed fully. 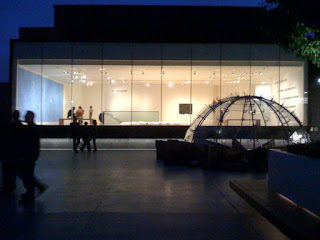 There is an update to my list of cafes of which I am fond, and that is Blue Bottle Coffee's (bluebottlecoffee.net) new location on the new roof garden at the San Francisco Museum of Modern Art (sfmoma.org). The museum already has a very good restaurant, but it is delightful to have yet another indoor/outdoor option. Up on the top floor, you can pass over a "bridge" between the main museum building and its garage, and find yourself in a pleasant, indoor space with two sculpture-filled patios on either side. 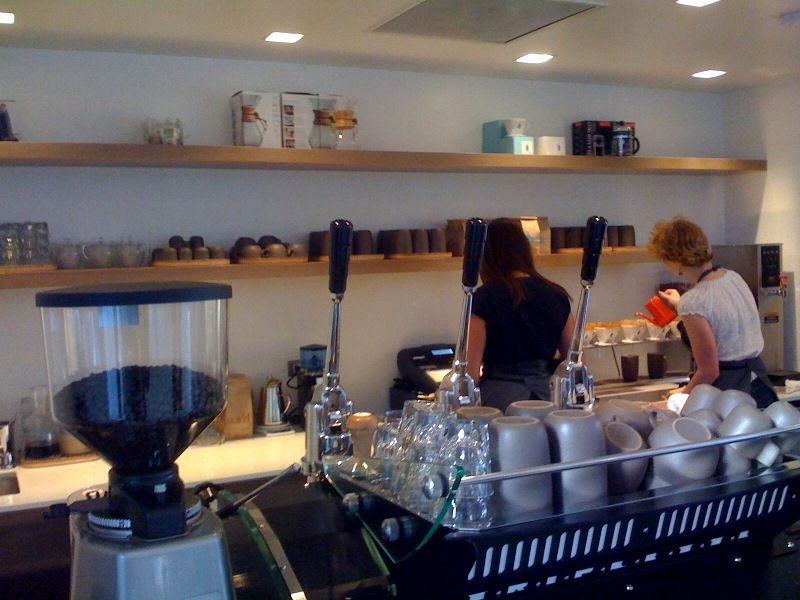 Blue Bottle is nestled into the far wall, behind an attractive sliding panel that hides the cafe when it is closed. When it is open, it is easy to find, because that is where the addicts are all lined up, waiting for their fix. The cafe is tidy, and the staff are pleasant and efficient, though BBC fans know that it takes some time for their perfect cup of coffee to be prepared. There is no drip tankard: each cup of coffee is brewed when it is ordered, carefully attended to, and served fresh and hot. The coffee is relentlessly delicious, and incredibly strong. The dishware is made locally by Heath Ceramics, and is satisfying to hold, even when not filled with hot coffee - though it is even better when filled with hot coffee. The sculpture garden is a peaceful refuge from the busy streets below, with a broad expanse of sky between buildings, a lovely close up of the gorgeous Pacific Telegraph building behind it, and views of construction cranes to the southwest. There are plenty of benches, and even when it is breezy, it is easy to find sheltered spot to sit and people-watch. Near the cafe is one of my favorite sculptures by Louise Bourgeois: The Nest, a grouping of protective, ever-larger spiders hovering over smaller ones. I hope I am as cool an artist as Ms. Bourgeois when I am a grown up. I'm also fond of Mario Merz's Lens of Rotterdam, which is new to me. I'll be spending more time here. There was a time when my circumstances forced me into a strange lifestyle: the lifestyle of both a full time law firm paralegal AND a full-time college student. During my weekdays, I would work 40 hours plus routine overtime on complex litigation cases; on alternating weekends, I would either be in classes from 8 to 5 or would be doing homework for those classes. I had no leisure time. The closest thing I had to leisure was a mental trick I played upon myself, in which I believed that work was a rest from school, and that school was a rest from work. Sometimes, on the bus to school or in a taxi heading home from a late night in the office, I would see people reading newspapers and drinking coffee, sitting in cafés as if in no hurry to be anywhere. I envied those people. Leisure was something so remote to my existence, that I began to fetishize the entire idea of sitting in cafés. It represented a lifestyle that I imagined I could never have. I completed my bachelor's degree on weekends more than a decade ago now, and left law firm life (hopefully forever) in exchange for the complex life of an in-house jill-of-all-legally-related trades. But sitting in cafés still has a remarkable allure. The entire idea of being able to sit still... I barely even understand it!! 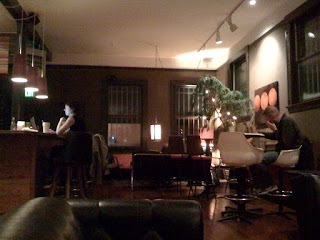 There are several places I like to go to sit, if only for a short time, and enjoy espresso drinks or sandwiches. I was reminded of this while cooling my heels at a cafe while waiting for a live music show to begin, after having been informed by the organizers that they were running at least an hour late. So, here is the list. Ritual Coffee Roasters (ritualroasters.com), 1026 Valencia St (near 21st) in the Mission and within Flora Grubb Gardens at 1634 Jerrold Ave (near Phelps) in the Bayview. Ritual is my favorite local micro-roaster. I've gushed in these pages before about the smooth power of their brews, and how their masterful roasts bring out a subtle fruitiness in their espressos... They are just wonderful. The Valencia location is convenient AND has a lovely selection of baked goods, including vegan sherry cake. The Flora Grubb location allows you to sip your powerful beverages while surrounded by exotic plants and garden furniture. 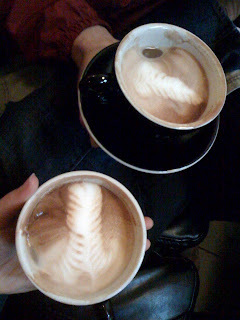 Peet's Coffee (peets.com and coffee.com), various locations. Peet's is a local chain, and their soy lattes are consistently excellent. They have a powerful tea collection; make a delicious and deceptively powerful soy chai that can keep me up nights; their locations often play lovely classical music; and whenever the salespeople grind beans, you can get a contact high from just being in the same room. Peet's spoiled me, and so I cannot drink at Starbucks, where everthing tastes weak. 2 hours of free WiFi if you ask for it. Blue Bottle Coffee Company (www.bluebottlecoffee.net), 66 Mint St. (at Jessie), Powell Station Area. This is another fabulous microroaster, one whose lines at the Ferry Plaza Farmer's Market are alarmingly long. Again, there is a pleasant subtlety to the flavor of their espressos that is supremely satisfying. Everyone at their cafe is VERY ALERT: there is also the added bonus of looking at all of their cool labware while visiting. 'Good stuff. Yes, I see a pattern... This is supposed to be about CAFÉS, and I'm writing about coffee suppliers instead. Sorry. Though these are all also good places to enjoy your excellent coffee. Java Jitters / the Coffee Lab, 1125 Ocean Avenue (near Lee), generally near City College in my home neighborhood - the Ingleside. Yes, they serve Ritual Coffee, and they do a fabulous job of it, but that's not the only reason I go there. Though it's a good reason! They also make great sandwiches on very fresh bread. 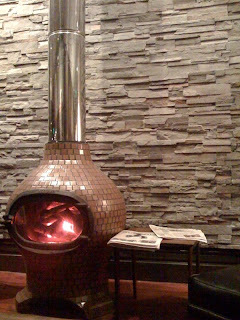 It is a pleasant place to hang out on a cold day with a steaming espresso drink and watch people walk past on Ocean. King's Cafe, 1901 Ocean Ave (at Ashton - across from the Jules K Streetcar stop - my streetcar stop), also Ingleside. Mmmmm, white mochas! This is where I go when I get out of the gym and am ravenous for a bagel or veggie sandwich. It's a very casual place, reasonably quiet (though I'm not a fan of TV, and there is one near the register), and the sandwiches and coffee are pleasant. The pastry selection is quite limited, but I'm not much of a pastry enthusiast. Free WiFi. 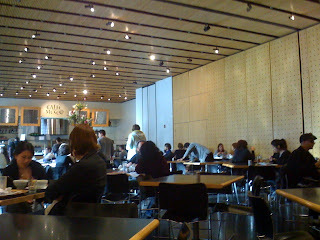 Caffe Museo (caffemuseo.com), 151 Third Street in SFMoMA, South of Market. 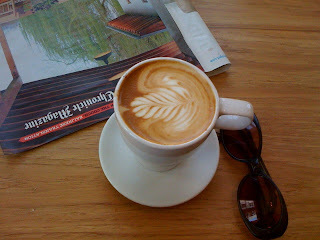 This is really more of a restaurant than a cafe, but the coffee drinks are satisfying - and the food is very, very good. I recommend the gnocchi especially. It is also glam. When I was on my sabbatical, I would sit there regularly with a retired girlfriend of mine, and marvel that I was ever a working stiff (and dread that I would ever be a working stiff again)... Ah, that was the life. 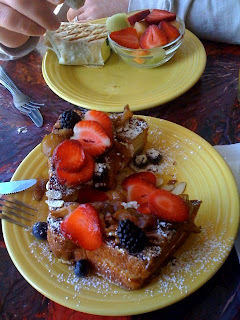 Simple Pleasures Cafe, 3434 Balboa Street (near 36th Avenue), Richmond District. I went there today! A friendly place with pastries, good coffee, tasty sandwiches, and cozy little tables. It's often quite full. Blue Danube Coffee House, 306 Clement Street (between 4th Ave & 5th Ave), Inner Richmond District. Coffee, Chai, waffles, wraps, sandwiches... It's a comfy place to hang out and eat. sugarlump coffee lounge (sugarlumpcoffeelounge.com), 2862 24th Street at Bryant in the Mission. This is where I went to cool my heels while waiting for a bunch of artists to get their show together. It is quiet, has free WiFi, and looks cool enough to be an upscale restaurant or wine bar - but it's better than that, because it's about coffee! (The photo at the top of this entry is also of sugarlump.) I plan to visit again and try out their lattes. My ulterior motive for today's visit to the farmer's market was to be in the greater Market Street/Powell Corridor, so I could have an excuse to go to Blue Bottle Coffee Company (bluebottlecoffee.net) and taste the rather famous beverages there. Their cafe on Mint Plaza has been open for a while, and I previously had posted Frank's photos of the cafe/coffee temple, which made me eager to visit. My life-sucking commute to Emeryville had prevented me from visiting on weekdays. So I took my chance and walked over. Their coffee is good. It's so very, very good. Hot damn, it's good coffee. It is a bright and delightful space, which was full of perky people. The staff were alert and nearly giddy. Spontaneous levitation and gravity-defying dancing seemed likely to break out at any moment. The cookies were the best little cookies I've had in months. Chocolate, peanut butter, and lavender... Perfect. Small, but perfect. I had... Eight? They are tiny, and heavenly. It was like a spa visit in the middle of the day, if you leave spa visits full of cookies and caffeine. I need to go back, and do many comparisons between Blue Bottle and Ritual to see which I love more. Even if I never can choose between them, which would be fine by me, it will be very happy research. Coffee: it has knocked my father unconscious; it gives my maternal grandmother heart palpitations; and it is a ritualistic luxury to me. Here in the Bay Area, there are serious coffee drinkers who are dedicated to one shop or brand over others, and who get fire in their eyes when discussing their favorite roast. Addictive substances are remarkable, aren't they? I have had good coffee in many places, but become especially giddy over GREAT coffee. Peet's, a beloved, locally based chain, consistently delivers stellar soy lattes unto me, and inspires a passionate following among its customers. (Yes, we look down on Starbucks drinkers. It cannot be helped.) There are other worthy coffee purveyors in the area, and a great many in the City, including two that inspire fear of making coffee a very serious habit. Ritual Coffee Roasters (ritualroasters.com) is one such caffeine temple. There is something about their potent brews that reminds you that the coffee bean really is a fruit. There is something... Fresh? Fruity? It is hard for me to describe coffee in terms that don't make it sound like wine. But there was a clarity in the flavor of my most recent soy latte there that made a small thought bubble appear over my head that said, 'I will take some beans home, buy a French press, and drink this incessantly.' That bubble does not want to pop. Meanwhile, the devotees of Blue Bottle Coffee (bluebottlecoffee.net) keep turning up, feverishly whispering the company's name with a far off look in their rapidly-darting eyes. Frank (chanarchy.com) has even made a documentary pilgrimage to Blue Bottle's gorgeous new shop to share the wonder of BB's magical ways: his photos from the cafe's opening day are posted here. On my foodie agenda: pilgrimages to both Ritual and Blue Bottle to compare, contrast, and bathe in the glories of steamy caffeine stimulation.